Cuhaci & Peterson's team of 33 participated in the 2016 Tour de Cure at Lake Nona, riding more than 1300 miles and raising more than $21,000 for the American Diabetes Association. 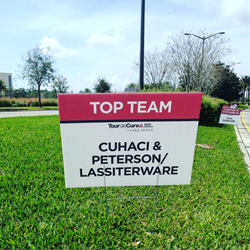 On March 13, 2016, Cuhaci & Peterson teamed with LassiterWare to ride in the 2016 Tour de Cure at Lake Nona. This is Cuhaci’s second year participating in the ride. With 33 team members, including co-found Lonnie Peterson and COO, Greg Simpson, over 1300 miles were ridden and over $22,000 in funds were raised to benefit the American Diabetes Association, placing the team as the third largest corporate fundraiser for the event. Team Captain, Chris Abbey noted, "Another great Tour completed by the Cuhaci & Peterson/LassiterWare team. The day started at 6am and turned out great! The weather held out and the expected rain did not fall on any of the riders. We had the first rider to need SAG (just a few scrapes) and had the last rider to finish. The day was great and the new location made the event more enjoyable." Additionally, Cuhaci & Peterson Co-Founder Lonnie Peterson said, “Just in my small circle of family and friends there are many who suffer with Diabetes—there is no question as to the importance and worthiness of this cause.” Of 96 Champions (participants who raised $1,000 or more individually), 9 belonged to the Cuhaci & Peterson/LassiterWare team, including 1 of the top 20 individual fundraisers for the entire event, John Kern. The other Champions from the C&P/LassiterWare team included Chris Abbey, Lu Burson, Mindy Delose, James E. Downs, Steven Duffy, Joshua Inman, Kenneth O’Neal, and Lonnie Peterson. All were recognized by the American Diabetes Association at a reception held Thursday, March 10th at Jaguar of Orlando. Corporate sponsors for the team included Quest Company, North American Properties, Jeremiah’s Italian Ice, Commercial Design Services, Engineering Assessments & Inspections, LLC, ep3, Inc., Great Southern Contractors, Hosting Matters, J. Raymond Construction, VHB, Wolf Financial Group, Birchmier Construction Inc., Compass Research and Wieland. Cuhaci & Peterson is a national A/E/P firm specializing in commercial design. Headquartered in Orlando, Florida since 1978, the firm also has offices in Philadelphia, Boston and South Florida and is registered in 49 states. Cuhaci & Peterson offers Architectural, SMEP Engineering, Fire Alarm/Protection and Landscape and Planning services on a variety of project types, as well as, In-House Government Relations and Interior Design.